The Making Of Isha Ambani's Wedding Outfits: Here's What Goes Into Dressing Up A Princess! The Isha Ambani-Anand Piramal wedding was the talk of the town in 2018 for two reasons. First, it was the the wedding of the Ambani heiress and second, because of the classy sartorial choices of the bride. Case in point: Isha secured a handful of her red carpet outfits from international designers like Valentino (the gold and ivory lehenga for the reception) and favoured her go-to Indian designers like Abu Jani Sandeep Khosla and Manish Malhotra for her wedding and pre-wedding celebrations. The show-stopper was undoubtedly Isha's custom-made off-white bridal lehenga designed by Abu Jani Sandeep Khosla. The bespoke lehenga also incorporated the 35-year-old saree that her mother wore Nita Ambani wore to her wedding. The ravishing lehenga featured a 16-panelled ghagra and a gorgeous trail. Each of the panels were embroidered with intricate Mughal jaali work and floral panels. Among the other detailings were red zardosi work on the borders and vasli, mukaish and nakshi work. We loved how the designers infused Indian craftsmanship with heirloom textile for Isha's pick for the day. The lehenga came with two dupattas- a tulle one that she carried on the shoulder and an elaborate sequin dupatta that covered her head. 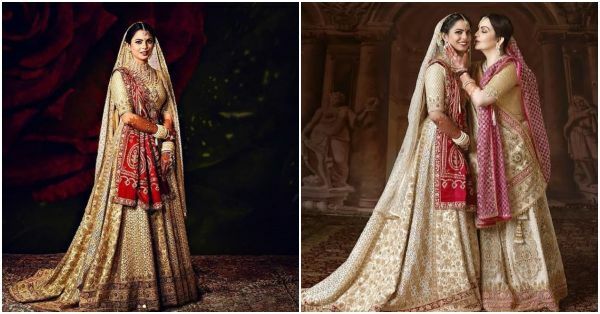 Following the suit, designer Manish Malhotra also shared two videos of Isha Ambani's sangeet lehenga and maha-arti lehenga in the making. For her Sangeet, she wore a gorgeous golden sequin lehenga. She matched it with a golden necklace, jhumkas and bangles. The Maha Arti took place on December 8th in Udaipur. Isha's outfit for the ceremony was a beauty in fuschia pink with stunning details in sparkling Swarovski stones. The lehenga was coordinated with a Swarovski blouse hand-crafted with floral motifs and a tulle dupatta in tasteful Swarovski layering. The designer also released the making video of Nita Ambani's lehenga for the Maha Arti. The orange lehenga was handcrafted with delicate floral streamers in zardozi work and had hand-embroidered sequins and floral embellishments all over it. It was paired with a heavily embroidered choli and a leheriya-inspired dupatta in red silk borders.